A great classic 8 bit sounding song from Littlescale youtube channel, made with LSDJ and the old Grey Gameboy. The Casio SK serie started with the SK-1 (one of the best selling toy keyboard of the period) and the target was a the consumer market. The little sampler was technically far from the professional counterpart like Emu or Akai, it was just a toy with a tiny memory of few seconds and no memory retain. Soon after the SK1 the SK5 followed. 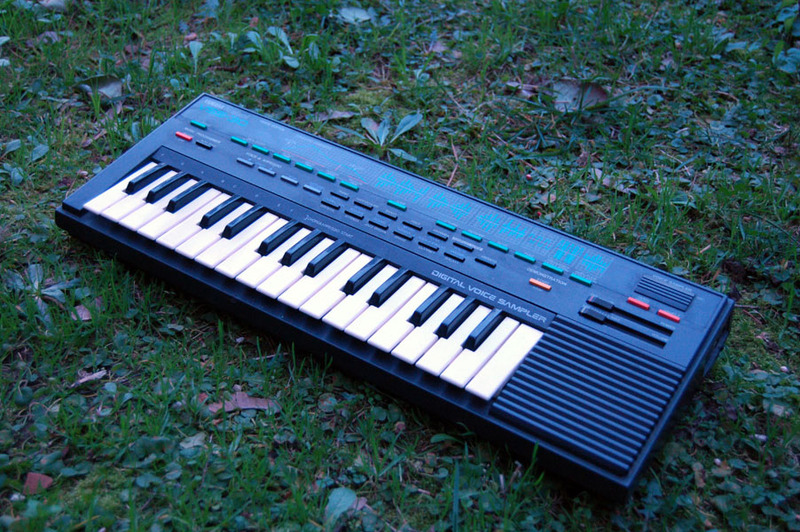 The sK5 was an upgraded version of the SK1 with more sampling time, the capability to sample 4 sounds and to retain the sound in memory even with the power swithed off (if the keyboard run on batteries). The sampling specifics were the same as the SK1 (8bit- 9,38KHz) quite low even for the time, and apart from didattic use by children, the sk seemed at that time just a toy. The cheap prices of second hads SK and the “Anti Theory” of Reed Ghazala made the fame of the little sk grow. The interesting circuit bending capabilities of this instruments made them popular between the circuit bending community as a “must have” together with the “Speak & Spell”. The Antitheory statement , by Reed Ghazala, is that you don’t have to know anything about electronics to do circuitbending. A circuit is not designed to have shortcircuits , so you have to “think different” ! The SK5 is now a well known and is now considered a “real instrument” , not just a toy, after many more or less inportant, famous or trendy artists used it. The heart of the instrument is a 8 bit sampler with a very lo-fi sound and 4 voice poly. It can samples 4 sounds and play them together with the rubber pads or with the keyboard. The performance can be registered with the onboard sequencer, with no quantization (you cannot correct the timing). Every sample can be edited with the “envelope shapes” that adds crescendo, sustain, vibratos etc., can be looped or reversed . The sample memory can retain the samples if the keyboard has batteries. There is also the possibility to choose a “long sample” time (it occupies 2 samples slots) to sample a loop for example. This is really great for lo-fi sounds. The second point is that the SK 5 is an easy instrument to circuit bend and the mods add a great variety of “tools” to shape new sounds with the twist of a knob or a simple switch, a variation not known, an aleatoric change, that’s why Ghazala called his mods projects “aleatrons”.